Ex-board member Mike Hall has revealed that Cardiff City were "minutes" from going into administration in 2006. By the end of the 2004-5 season Cardiff were losing £9m a year and had debts of £30m, with players being paid late and key squad members being sold. 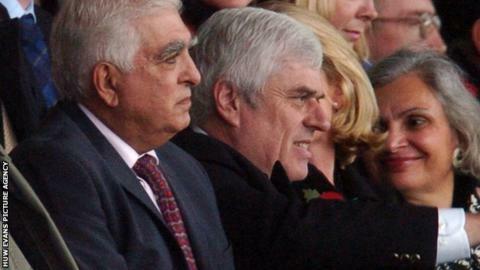 Sam Hammam was replaced as chairman by Peter Ridsdale in October 2006 in a move Hall says helped save the club. "We had to take control away from him, which was a sad moment for him, but ultimately saved the club," Hall said. "I think a lot of fans are black and white with Sam... he was trying to do the right thing, I think he did the right thing for a number of years there, he brought a lot of success to Cardiff. "But ultimately he was undone by... trying to do too much, spending too much money and he couldn't accept that, and then he took out some huge loans against the club that almost buckled us." Former Wales and British and Irish Lions rugby union international Hall, 49, is a director of PMG Developments which became a minority shareholder at Cardiff City. Hall, who had two spells on the Bluebirds board, told BBC Wales Sport that had the Welsh club gone into administration in 2006 it would also probably have seen Cardiff relegated, because of the points deduction levied on clubs for such financial strife. "We had a showdown with him [Hammam] in the old boardroom at Ninian Park where he basically got up and stormed out," Hall said. "I remember I went to the gym thinking 'that's it, we're going into administration' - we were in the middle of the Championship at the time as well so that would have meant almost certain relegation. "Administration would have almost certainly meant the end of the [Cardiff City] Stadium project as well. "He rang up at the noon deadline - typical Sam style - and he signed it and faxed it through at 11:55 and Peter Ridsdale was installed as chairman and the funds flowed into the club to keep us alive for a while." The boardroom changes relieved the immediate pressure on Cardiff, but the club continued to be haunted by its financial state and it survived three winding-up orders in the 2009-10 season over unpaid taxes. There was also an outstanding debt of £24m to main creditors Langstone - whose spokesman is Hammam - that was only settled in July 2013 after current owner Vincent Tan took control of Cardiff. "It was an extraordinary time... Sam Hammam, Peter Ridsdale and lately Vincent Tan, all huge personalities in their own way," said Hall. He continued: "It is sometimes like a theatre show and the money that is involved in the game now is extraordinary, and with money you get all the 'sharks', the agents and everyone else swimming around. "It made for a very interesting time." Under Tan, Cardiff were promoted to the Premier League for the 2013-14 season but were relegated after one season in the top flight. Cardiff are currently 12th in the Championship under new boss Russell Slade, with Ole Gunnar Solskjaer and Malky Mackay both having departed as manager within the last year.